76127 Captain Marvel and The Skrull Attack revealed! 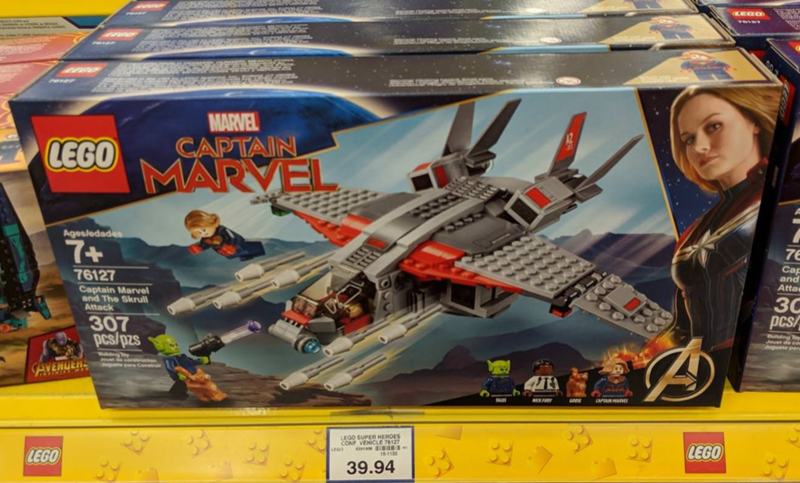 A previously unknown Marvel Super Heroes set, 76127 Captain Marvel and The Skrull Attack, has emerged in a Canadian branch of Toys R Us. This image was taken by Reddit user optiprimas. The set contains an impressive Quinjet from the upcoming Captain Marvel movie alongside Talos, Nick Fury, Goose and Captain Marvel herself. Its Canadian price of $39.94 should equate to around £29.99, $29.99 or 34.99€, corresponding with 76100 Royal Talon Fighter Attack and 76104 The Hulkbuster Smash-Up. I really miss having TRU in the U.S. at times like these. This set looks interesting. Is this the first time a cat has appeared in the minifigure line-up? I will definitely be getting this, I am really looking forward to this movie. I just love that not only do we now have Skrulls, but we retroactively always have had them (and probably still do). Loki's death in "Infinity War"? Nope, that's a Skrull! You see where this goes. YES!!! I knew I would want whatever set they would make for Captain Marvel, but I'm so so happy that it actually has a decent build! One of the better-looking Super Heroes sets in the history of the theme, imo, and that Nick Fury minifig looks pretty great. Well at least we can now assume that we won't have another quinjet being shoved into A4 sets so that's good. I really don't understand the reasoning for Lego not just labeling everything under the Marvel logo but oh well. Box art is on fire this year. Probably the best its been in the sh sets. I think that this set would be great for kids, lots of them probably would love a quinjet but not want to spend lots on it. So I understand why Lego made this set. I this the jet is fine but I wish it was bigger and more similar to the 2014 Milano. I doubt the interior is anything special but at least their is one u like many other sh sets. I like the Captain Marvel figure but the rest are boring. That Skrill is very silly looking. I do think this is the best Mar el set Of 2019 though. At least I have an urge to buy the set. Hopefully the A4 sets pick up some of this winter wave slack. I like the new box art with a large character on the right side. Would like to see that more. Looks good! Was hoping her vehicle wasn't another Quinjet. Something more original would've been nice (Kree Warbird?). Wonder if any other stores have this out on the shelves? What's going on with that hailstorm of flick fire missiles? YES! Flick fire missiles are back! Hope there are more flick fire miss.es coming up next year. I like them more than the spring loaded type, so much harder to accidentally fire. Chewie/Goose (The Cat)!!! - I can not wait to see how that character is handled in the movie! This is a great looking set! Looks cool! Hopefully there is another set for the movie as well though as is usual for MCU movies (with the exception of antman and the wasp). If this is really only £29.99 it's on my to buy list. Love the look of the set and the rang eof figures included. Can see why they'd rename Chewie to Goose though to save any brand confusion now Disney owns Marvel and Star Wars... Plus, given the Top Gun vibe the trailers for Captain Marvel have given, makes sense her cat sidekick would be named Goose. @GrizBe: I also saw speculation that Goose might be named differently so that they can introduce "Chewie" as a different cat after the time skip to Avengers 4 (since if Goose lacks Chewie's extraterrestrial origin from the comics, they might not be expected to live that long). Anyway, pretty cool set. Not really one I plan on getting but it has a unique look that seems to me like it might take some inspiration from the kinds of military MOCs I see at conventions (mainly in the use of that cockpit slope horizontally). Anyone find it comical that Shazam and this movie are coming out at approximately the same time, and in the Saturday morning cartoon, Shazam’s actual name is captain marvel?? Oh the irony!! @Your future president....yep, so many 'marvel's' throughout comic books. Fawcett's then to DC Comics Captain Marvel (Shazam) in 1940 onward , then the Marvel Family (Captain Marvel Jr., Mary Marvel), then Marvel Comics' Captain Marvel (Captain Mar-Vell), and Ms. Marvel, the X-Men's Marvel Girl (later becomes Phoenix) and there's many different alter ego's for Marvel's Capt. Mar-Vell and Ms. Marvel too. I really like the build, but for once the figures disappoint me. Talos needed a tiny bit of printing on the headpiece to make it look more natural, and the reused faces on Nick Fury and Carol Danvers aren’t perfect. Carol herself desperately needed some arm or leg printing, as well as a more accurate hairpiece. I also wish she was wearing the green suit in this set since we’ll definitely get an Avengers 4 set with the red look. Overall I still like the set a lot, but I’m just not thrilled with the figures. The ship Looks an interesting build, however would of been nice to add a few skrulls to the set lego could of made a better shaped head for our shape-shifting friends where the head and ears were moulded rather than use that same piece used on The genie from Aladdin again, and also not keen on Danvers hair piece i expected a better wig to be used, Meras hair piece from the Aquaman set was disappointing too..
Crazy time line with Captain Marvel/Shazam. Goes from Whiz Comics in 1940 as Captain Marvel, then DC/National Comics lawsuit stops their publication in 1953 I think. Terrible lawsuit I believe to just knock out the competitor since Whiz Comics is the top selling comic of all time. Like 12 million plus first issue with Captain Marvel and millions upon millions every month for over 10 years. In the UK, they did black and white reprints and didn't want to stop a popular comic for them so changed it to Marvelman and also to Young Marvelman (that's Captain Marvel Jr). There's a Kid Marvelman too. Goes strong with new stories and same type of origin but instead of a wizard it's a scientist, and instead of saying Shazam, he says Kimota (atomic backwards). More of a science based origin instead of magic. Briefly after this I believe another publisher continues it as Captain Miracle about 1960. Marvel Comics comes in like late 60's with their own Captain Marvel (Captain Mar-Vell). Totally different origin, look, stories, etc. DC Comics in 1972 license the old Shazam Captain Marvel characters but since Marvel has the copyright on the name, they just use Shazam for all the titles on the books and shows, etc. Marvelman is revived again in the 80's in the UK for a bit with new stories and changed it to Miracle Man to avoid any issues with Marvel Comics. Long road with this character and name. I think even in Brazil the Marvelman book was renamed Jack Marvel. Little known fact, old Legodad here in his younger days was known as Young Marvelman to the ladies but that is a story for another day. Isn’t this the first time a Marvel actor is seen on the box art? Why are everybody calling it " quinjet" ??? Hooray for quad-flickfire missiles! I loved the barrage of easy-to-find (compared to studs...) projectiles that flew from 7066. And, wow! A Lego Flerken! The prototype Quinjet looks great but I will pass on this, the Skrulls went to far with attacking a cat, down with them. I like the build but they choose a bad hairpiece for Carol. It's the same from Widowmaker. The headpiece also doesn't seem to have white attacking eyes. Hell, not even the cool blast effects from Infinity War are included. I'll wait for an Avengers 4 set with Captain Marvel. Wow, LEGO is fast on these things. I hope we can see much, MUCH more superhero sets in the future. I’ve got a great feeling about 2019. I'll be getting this when it's available in US stores (not TRU, of course). For the price, the Quinjet is nice and we'll built. But it still doesn't compare to that gorgeous original 2012 one. That Quinjet build is much better than the old one. Escpecially around be cockpit section. The overall size might be way smaller but the look of it much more matches the look of the in-universe plane. Reused Qi'ra face, bad hairpiece, wrong color? Barely any printing and no dual molding. I'm not *expecting* dual molding but I expected a little more effort. Will probably spend my money on something else Lego has. Oh Man I'm super pumped for this. Young Nick Fury...yes please. I love this. I really want Lego to revisit past Marvel movies though, like Star Wars. Marvel has made twice as many movies as Star Wars, I think they could do well to do stuff like Red Skull's car or an Iron Monger set. @Your future president I think you might be mistaking irony for a coincidence.